...... 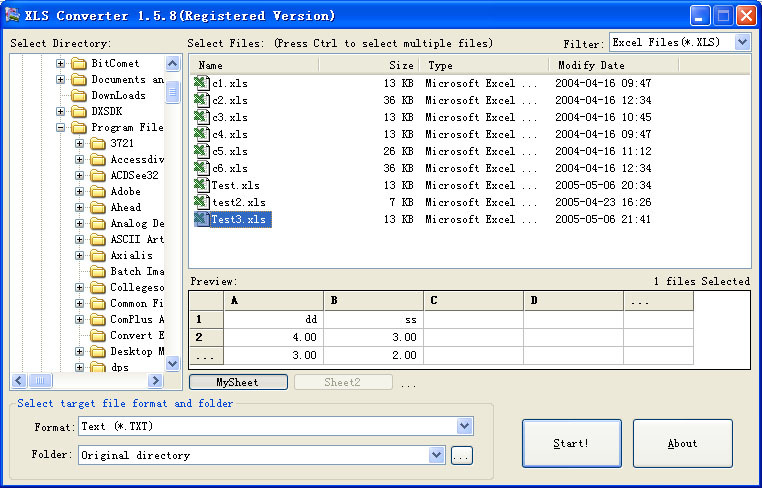 The interface is very neat and very powerful, you don't need to open windows explore first, you can select the directory from folder tree in the program, and then the files will list in the right pane, depend filters you have chosen, other files will not list in it! Qweas is providing links to XLS Converter 2.5.9 as a courtesy, and makes no representations regarding XLS Converter or any other applications or any information related thereto. Any questions, complaints or claims regarding this application XLS Converter 2.5.9 must be directed to the appropriate software vendor. You may click the publisher link of XLS Converter on the top of this page to get more details about the vendor.